The peregrine falcon (Falco peregrinus) is a bird of prey native to temperate and tropical regions across much of the world. Their range is huge and there are currently 19 recognised subspecies. All specialise in hunting other birds in flight, perching on a convenient vantage point and scanning the horizon for possible prey. Once they have picked a target the falcon will fly above it before tucking their wings into their body and dropping upon them in a manoeuvre known as a stoop. They have been recorded achieving speeds in excess of 240 miles an hour which makes peregrine falcons the fastest animals that we know of. 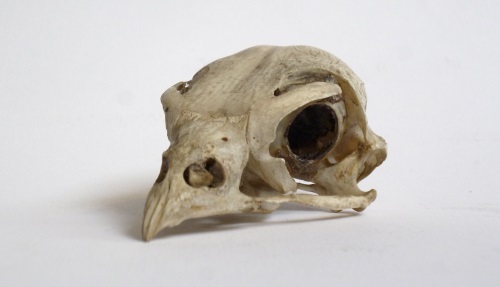 LDUCZ-Y1721 peregrine falcon skull. Note the baffled nostrils. 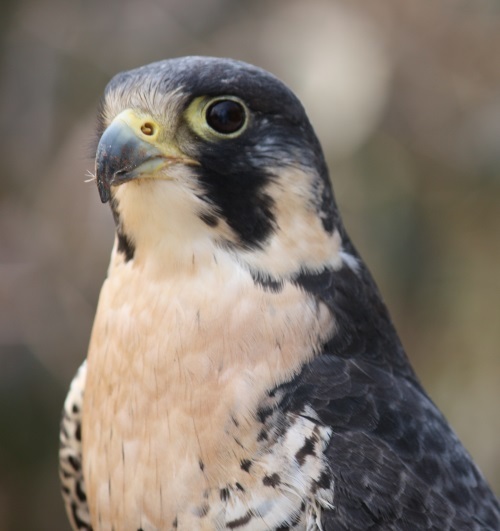 The adaptation necessary to travel at these speeds is incredible: peregrine falcons have transparent third eyelids which effectively allow them to close their eyes against the wind and still see. Their nostrils have little cone-shaped, bone tubercles (or baffles) that limit the amount of air that can pass through (click here for a closer look). This means the birds can breathe but can also tolerate the high pressures which would otherwise cause their lungs to rupture. There is an urban myth that the design of the inlet valves for jet engines was based on a peregrine’s nostrils… it could be true. “Naturally” peregrines nest on cliff faces or rocky crags, laying their three or four eggs in a simple groove scratched into the dirt or gravel known as a scrape. There are still a lot of cliffs about, often accompanied with large seabird colonies on which to feed the chicks, but cities filled with pigeons and tall buildings (artificial cliffs) are excellent substitues. We are lucky to have over 30 breeding pairs in London alone. Unfortunately for urban birders, peregrines are fiercely territorial and will not tolerate other birds of prey in their space. The females, who are significantly larger than the males, defend a pair’s borders first with a display and if necessary with violence. 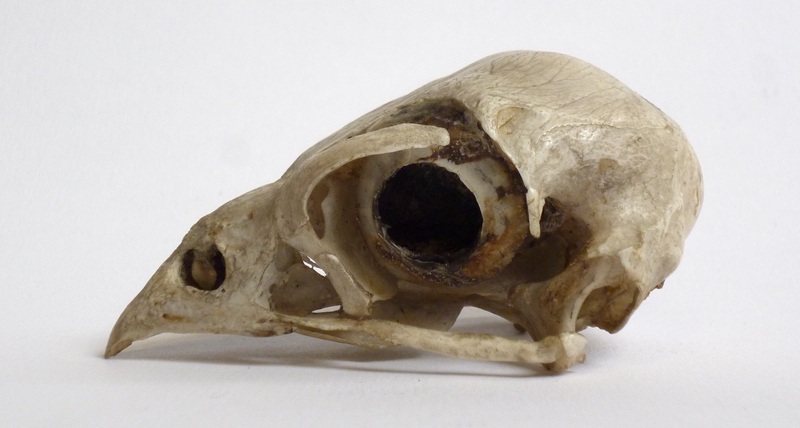 This means that although large cities are packed with food (no shortage of pigeons) and available nest sites (or buildings) the falcons appear unable to live much closer together. The IUCN estimates the global population at around 140,000 birds which, despite falling dramatically across the 20th Century, now appears to be stable. Thanks Will, definitely a deserved place in your pantheon of the ‘Best of Beasts’. If anyone wants to read more about the Peregrine I would recommend J.A. Baker’s ‘The Peregrine’ (1967). It is a beautiful account of a winter spent following Peregrines on the Suffolk Coast.